In this process, metals and alloys are plastically deformed into semi-finished or finished products by being pressed between two rolls which are rotating. The metal is initially pushed into the space between two rolls, thereafter once the roll takes a ‘‘bite’’ into the edge of the material, the material gets pulled in by the friction between the surfaces of the rolls and the material. The material is subjected to high compressive force as it is squeezed (and pulled along) by the rolls. This is a process to deal with material in bulk in which the cross-section of material is reduced and its length increased. The final cross-section is determined by the impression cut in the roll surface through which the material passes and into which it is compressed. 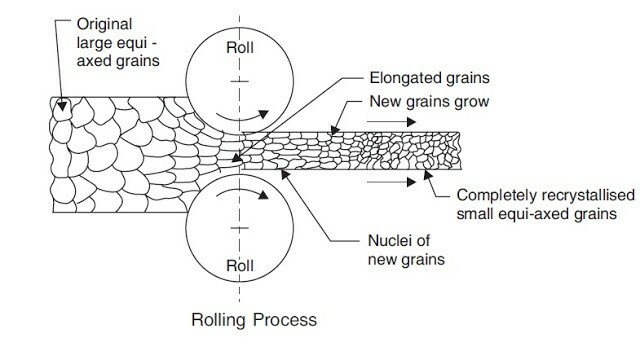 The essentials of the rolling process can be understood from the figure. Rolling is done both hot and cold. In a rolling mill attached to a steel plant, the starting point is a cast ingot of steel which is broken down progressively into blooms, billets and slabs. The slabs are further hot rolled into plate, sheet, rod, bar, rails and other structural shapes like angles, channels etc. Conversion of steel into such commercially important sections is usually done in another rolling mill called merchant mill. Rolling is a very convenient and economical way of producing commercially important sections. In the case of steel, about three-fourth’s of all steel produced in the country is ultimately sold as a rolled product and remaining is used as forgings, extruded products and in cast form. This shows the importance of rolling process. It is the first product obtained from the breakdown of Ingots. A bloom has a cross-section ranging in size from 150 mm square to 250 mm square or sometimes 250 × 300 mm rectangle. (ii) Billet: A billet is the next product rolled from a bloom. Billets vary from 50 mm square to 125 mm square. (iii) Slab: Slab is of rectangular cross-section with thickness ranging from 50 to 150 mm and is available in lengths up to 112 metres. (iv) Plate: A plate is generally 5 mm or thicker and is 1.0 or 1.25 metres in width and 2.5 metres in length. (v) Sheet: A sheet is up to 4 mm thick and is available in same width and length as a plate. (vi) Flat: Flats are available in various thickness and widths and are long strips of material of specified cross-section. (vii) Foil: It is a very thin sheet. (viii) Bar: Bars are usually of circular cross-section and of several metres length. They are common stock (raw material) for capstan and turret lathes. (ix) Wire: A wire is a length (usually in coil form) of a small round section; the diameter of which specifies the size of the wire.